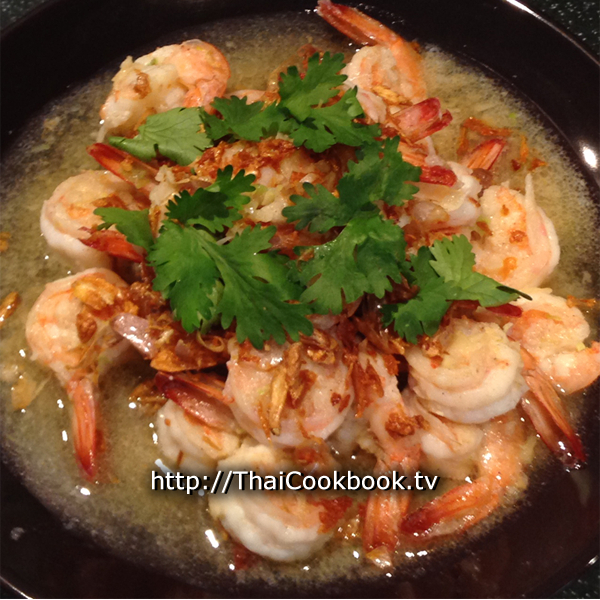 This lovely stir fried dish just takes a few minutes to make, and who can resist the delicious sweetness of fresh, plump, and juicy shrimp cooked in a rich sauce flavored with lots of garlic and fresh coriander root? Our recipe is topped off by homemade fried garlic chips, adding a flavorful crunch. It's a nice change from spicy foods. What's in our Garlic Prawns with Crispy Garlic Chips. 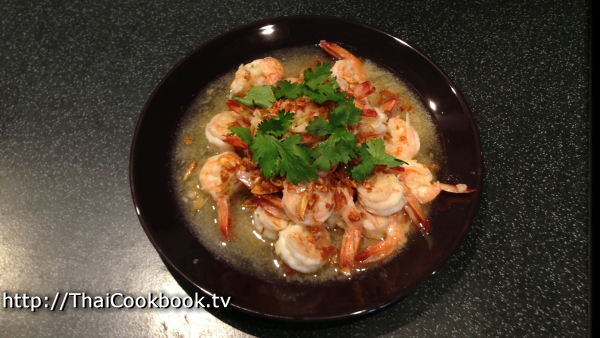 How we make our Garlic Prawns with Crispy Garlic Chips. 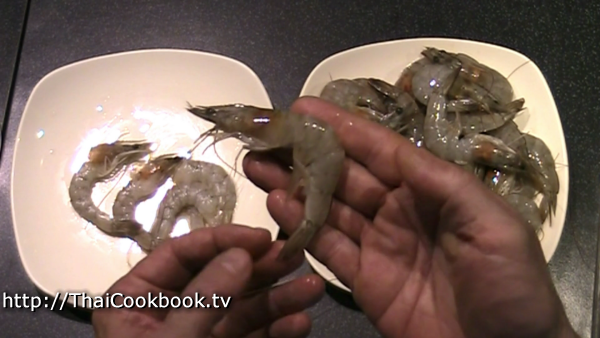 1) Remove the heads and shells from the shrimp, clean and devein them well. 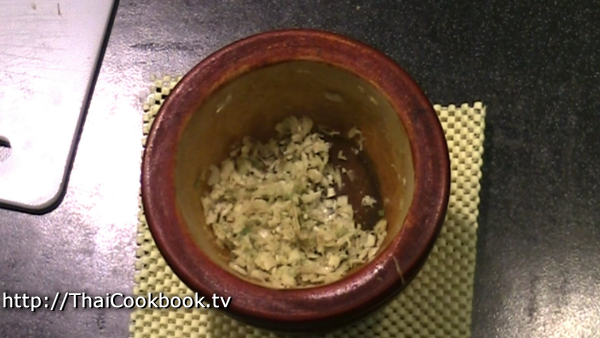 2) Grind the garlic and coriander root together into a very fine mush, then mix together with fish sauce, sugar, and ground white pepper. Add the shrimp and marinate for 15 minutes. 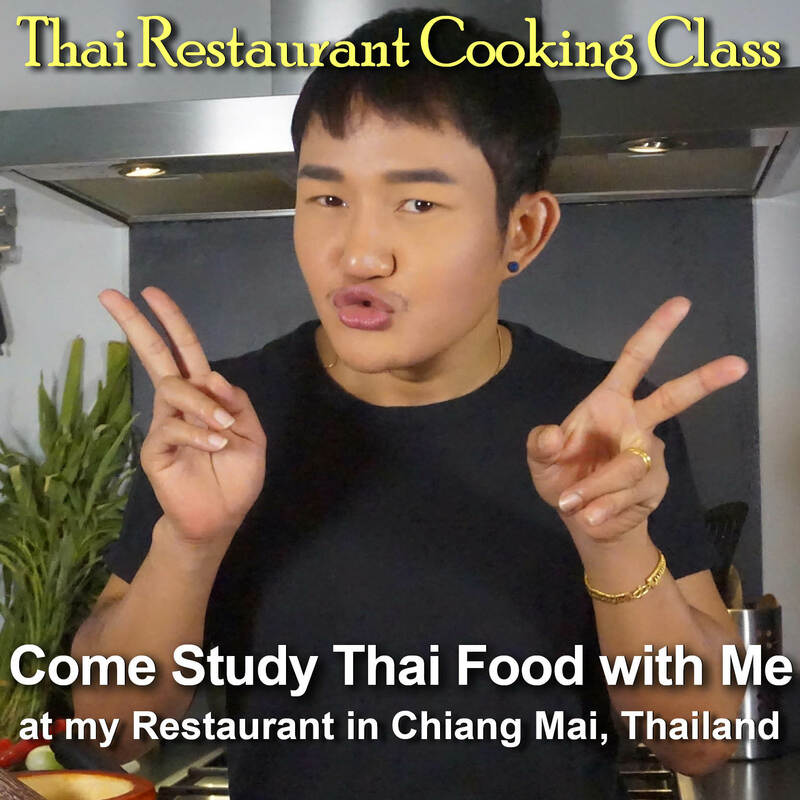 3) Heat oil in a wok or frying pan, over low - medium flame. 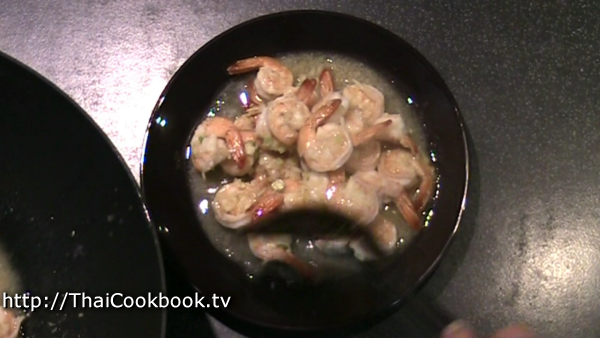 Add the shrimp and cook slowly until they turn pink and curl up. 4) Serve immediately on a small plate. Sprinkle with fried garlic chips, then garnish with cilantro. Select nice fresh prawns. Any size will do fine, but a medium size is best for this recipe. Remove the heads, unless you want to leave them on and cook them also. If leaving the heads on, be sure to wash out the body cavity well. Remove the shells from the body and cut the tail a little to expose the main vein. Remove the vein and wash the tails well. Fried garlic chips can be found in some Asian markets, and they are readily available in Thailand, but I still prefer to fry my own. I you want to buy it, then just skip these next steps. 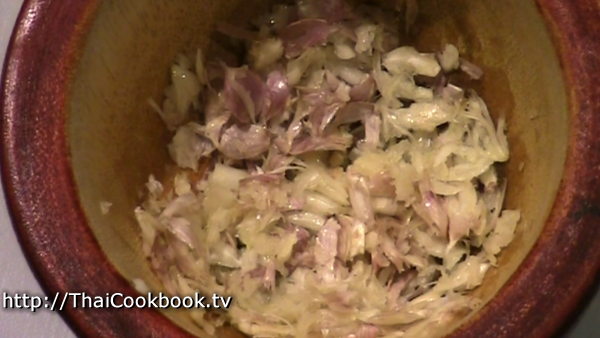 I select the small garlic that we have here to do this, but large cloves will also work fine. You can leave the shells on the small type and they fry up well and add good texture, but if you have the large gloves with hard shell, peel them well and cut the hard part off the base of the clove. Ether type, grind them up well in a mortar and pestle, food processor, chopper, or garlic press. I like the texture when doing them by hand, and the large and small bits make it nicer. In a small frying pan, heat 1/4 cup of vegetable oil over low flame. Fry the garlic slowly until it gets slightly brown. Not too long, and not too hot. It will easily burn and spoil the flavor. Drain it through a strainer to get rid of all the oil so it will be dry as it cools. Next prepare marinade for the shrimp. 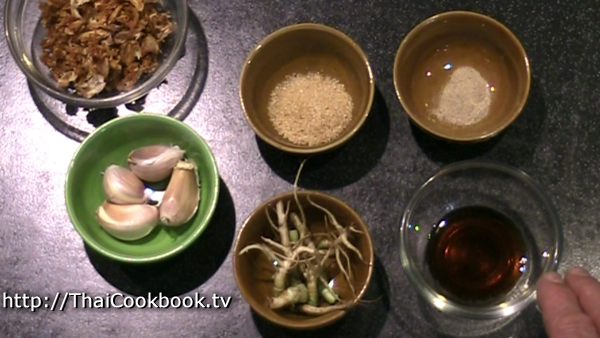 It is 3 - 4 large cloves of garlic, pounded together with some fresh coriander root, then mixed together with some fish sauce, sugar, and ground white pepper. 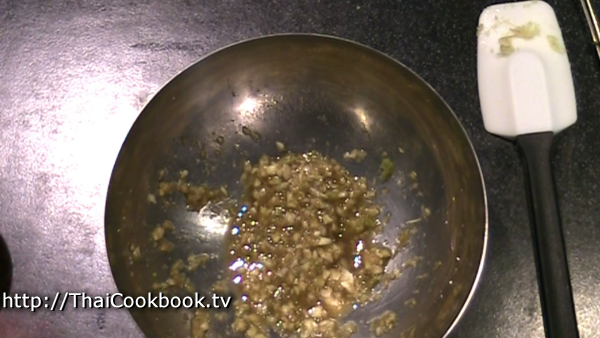 Grind the garlic and coriander root together into a very fine mush. Stir everything together in a medium sized bowl. 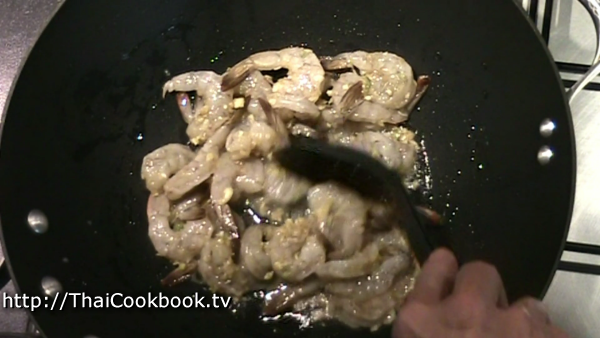 Toss in the shrimp and coat them well with the herbs and spices. Let stand for 15 minutes. 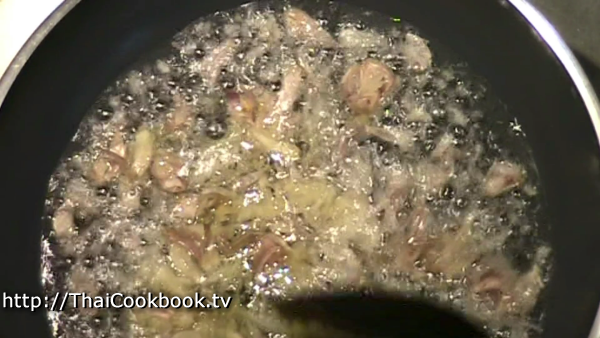 Heat 1 Tablespoon vegetable oil in a wok or frying pan, over low - medium flame. Despite what you may have heard, not all stir-frying is done at super high heat. You can quickly burn this up and spoil the flavor of the garlic and these beautiful shrimp will be as hard as little rocks. 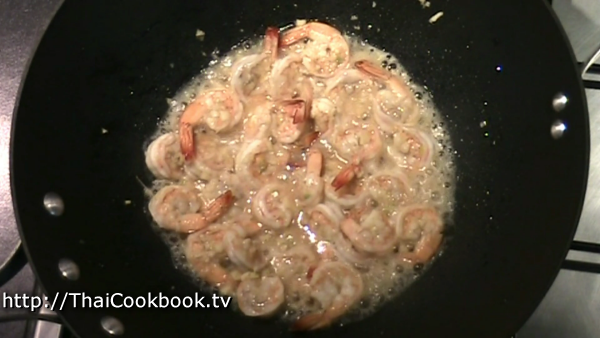 So, add the shrimp to the pan and let it slowly get hot. After about 1 minute you should see them turning pink. Keep stirring the whole time. Let the sauce get hot and bubbly for about another minute. When the shrimp are curled up and all pink, they are done. 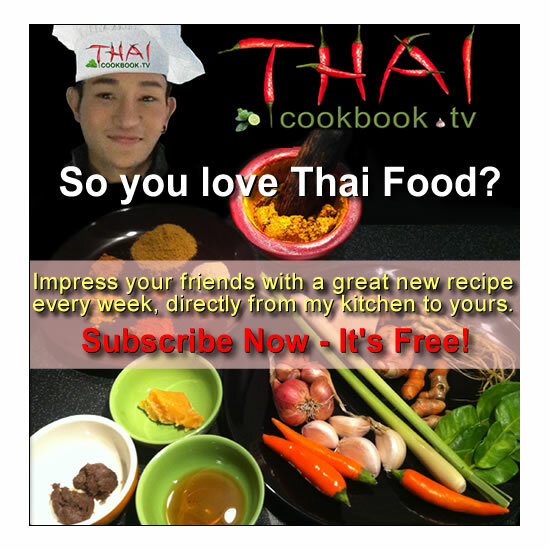 Serve on a small plate to be shared at the table, eaten with rice and other foods. Sprinkle about a tablespoon of the fried garlic chips, and garnish with fresh cilantro (coriander) leaves, parsley, or celery.